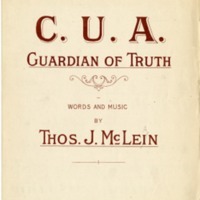 On January 18, 1936 The Confraternity of Christian Doctrine (CCD), under the leadership of Edwin O’Hara, Bishop of Great Falls, Montana, organized a Committee for the Revision of the New Testament, working from the Douay-Rheims version of the New Testament, a translation from St. Jerome’s Vulgate. Also at this time it was proposed that there should be a permanent organization of Scripture scholars. This proposal was made by Romain Butin, a faculty member in the Department of Semitic and Egyptian Languages and Literatures at CUA. His proposal was met with unanamous approval and the name chosen for this new organziation was The Catholic Biblical Association (CBA). 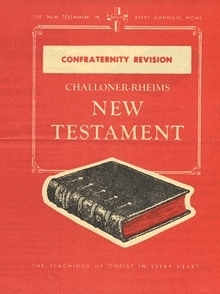 The CBA worked on the New Testament revision for the next five years. During this time it was decided that revision work should be done on the Old Testament. 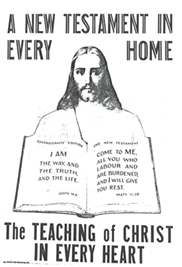 The New Testament revision was complete in 1941 and was published by St. Anthony Guild Press, Patterson, New Jersey. Below is a portion of the manuscript of the Gospel of John. The primary revisor of this gospel was Msgr. William L. Newton. The English expression of the text was edited both by William McClellan, S.J., and Dr. Joseph Christopher. In September of 1943 Pope Pius XII issued Divino Afflante Spiritu which urged biblical scholars to employ the historical critical method. It also called for scholars to use the original Hebrew and Greek texts of the Bible. 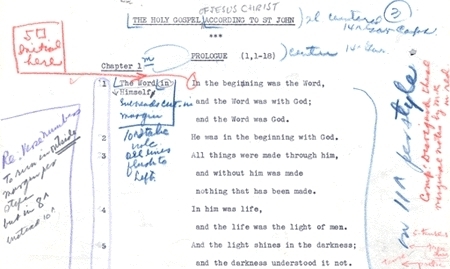 By 1944, the CCD and the CBA began a new translation of the Bible from the original languages. Their efforts would produce the New American Bible, which they continue to revise in order to maintain current standard English usage, and in order to consider new archeological discoveries like the Dead Sea Scrolls which shed new light on the text and history of the Bible.